Now that the spring sunshine has finally arrived, I thought I would revisit a chart that I showed at an STA conference last year and which was subsequently picked up by Ofgem Chief Exec Dermot Nolan in a speech to Energy UK (and misattributed to Cornwall Energy…). Ofgem has also used it more widely as part of their narrative on energy system change, including talks on their innovation plan and smart energy. It is all to do with the dangers of underestimating the potential pace and power of power system transformations. 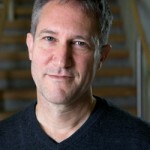 When Ofgem changed its regulatory framework for networks in 2010, to the exotically named RIIO (Revenue = Incentives + Innovation + Outputs), it allowed electricity distribution networks to start doing some planning ahead for the expected wave of low carbon technologies that households and SMEs would invest in. In particular, it asked distribution network operators (DNOs) to form ‘best views’ of future growth on their networks of electric vehicles and heat pumps on the demand side, and solar PV on the generation side. DNOs were required to present these views in their business plans, along with investment plans for accommodating this technology growth, and a smart grid development plan. In developing their ‘best views’ for LCT growth companies were expected to draw on a number of scenarios produced by the Smart Grids Forum, which were in turn based on scenarios in the government’s 2011 Carbon Plan. There were three scenarios (as there often are), and Ofgem took the view that growth was likely to be slow in the first RIIO period for electricity distribution networks (2015 to 2023) and then taking off thereafter. DNOs broadly shared this view, almost all adopting the ‘low’ or ‘medium’ scenarios in their business plans (for more detail see here). A senior representative of one DNO is on record as having said that the Carbon Plan scenarios were “very ambitious”. But of course we now know that, on solar PV at least, these scenarios were hopelessly wide of the mark. 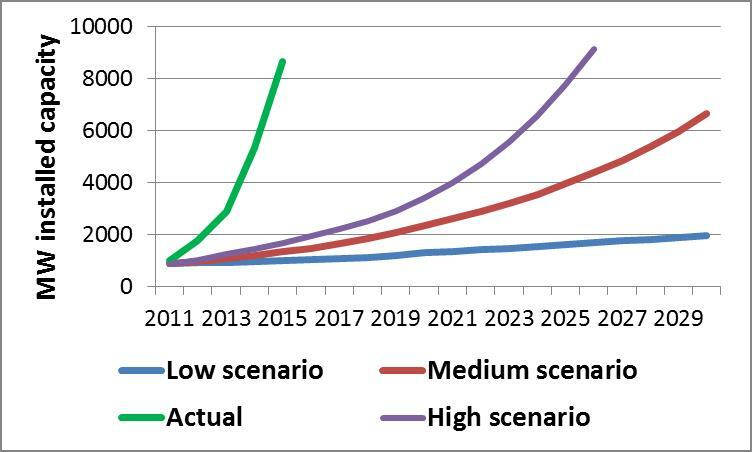 The figure below shows the three scenarios and the actual deployment of solar PV from 2011. By the end of 2015 we had almost 9GW of solar PV, an outcome that was supposed to be reached in the high scenario only by 2026, and that is way above total deployment in 2030 in the low and medium scenarios. The reasons for the surge are well known – costs were falling so rapidly that solar PV became a very attractive investment, and the ground-mounted market took off at a vertiginous rate in addition to the rooftop market exploding. The consequent challenges that some DNOs faced in accommodating this growth, especially in the south of the country, are also familiar. But my point here is that there is a danger in taking a conservative view on technology take-up. Governments, regulators and network companies have a bias towards a concern with stranded assets that has made so-called ‘anticipatory investment’ difficult in the past. But the solar PV story shows that when tipping points are reached, things can change very quickly. It is not inconceivable that what happened with solar PV will also happen with electric vehicles. If Elon Musk really can accelerate the existing downward trend in battery costs, we may well see a sudden surge in people buying, and charging, EVs. For networks, that will make the solar PV boom look like a walk in the park.